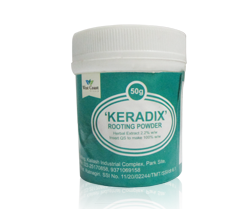 Keradix is highly active root-Growth - Promoting powder in carefully chosen carrier. The very small amount of Keradix is readily absorbed by the steam of the cutting which is thereby stimulated to form roots. In relatively short time treated cuttings produce a healthy fibrous root system. Cutting should be preferably 10 to 15 cms long with the lower leaves removed. lactral shoots from the current growth are usualiy the most reliable and are best taken at a nod of join or with a ‘heel’ Dip the base of the trimmed cutting in 1-2 centimeter of water. Stir the base of the cuttings in the Keradix Powder. Tap against the rim of the container to remove the surplus powder. Cutting od Semi hard & hard.